Hans Christian Andersen Tale For Children Lights Up The Bas Bleu Stage. 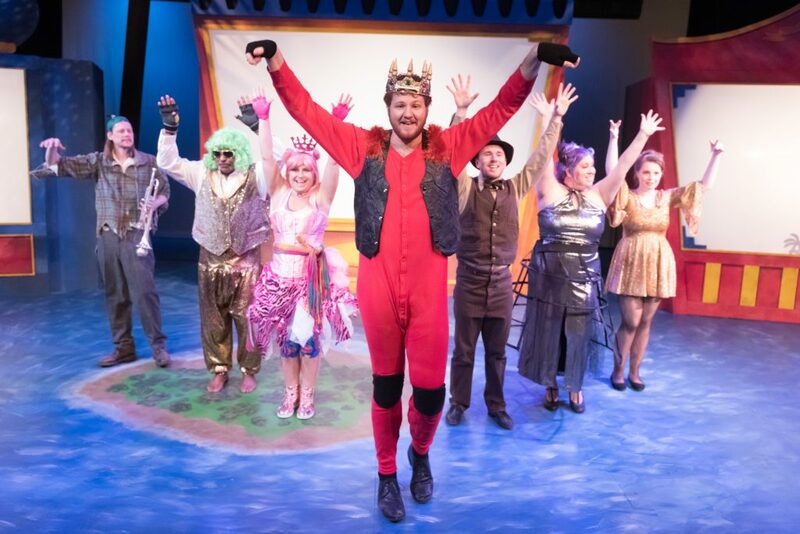 With guileless delight six talented performers take stage this season having great fun explaining why they are NOT“The Greatest Show on Earth.” No, there is nothing “great” or even “showy” in this charming silliness recounting of a Hans Christian Andersen tale. “The Flea and The Professor” is reportedly his last creation. He was nearly 70 when he came up with this story that few have read. I wonder what he might have been smoking at the time, as there is neither rhyme nor reason why this should ever see the light of day as a story, let alone as a stage musical. That said, Bas Bleu has produced a beguiling evening of fun. 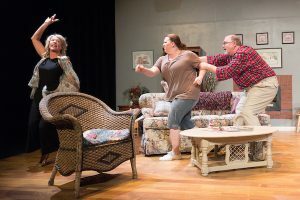 The cast has no worries about staying on key or in step, allowing the audience to have as much fun as they appear to be having. Graeme Schultz has a gee-whiz charm that grabs the audience from the outset as The Professor. He has big ideas, but nothing that can amount to much. He longs to follow in his father’s footsteps in the air as a hot air balloonist. But first must find some means of employment, trying his luck as a carnival magician without much talent, and without much magic. His story is told by Sarah Paul-Glitch who begins the show as the story teller and ends up as The Professor’s wife. They are quite a pair. As his magician’s assistant, she is not willing to always disappear on stage or be sawed in half, so disappears from his life. When The Professor’s luck and abilities have completely vanished, he scratches himself to find he has a flea. Not just any flea, but a flea with great ideas and a desire to be “a friend.” John Kean is probably six and one-half feet tall, and he emerges as the flea in The Professor’s life. He is a goofy wonder on his own. They develop an incredible friendship, making a pinky-pact to be lifelong buddies. They even develop a stage act that becomes unbelievably popular. No, it makes no sense. But that is the charm of the entire 80-minute show of friendship and acceptance. And it is a musical. No melodies to carry you home, but they do provide winsome joy on stage. The show is a charmer. Joining the three are Jennifer Brayas a 12-year-old spoiled and pouting Cannibal Princess, Kelly Forester as an over-the top Cannibal Queen, Michael Anthony Tatmon as the Cannibal King, and showing up everywhere doing everything is Paul Brewer as the Sea Captain, Loyal Subject, and everybody else. It is quite a troupe of rag-tag players, dressed in fashions that befit no one, but exuding delight at every silly moment. The Professor and his flea take their popular “show” around the world. They end upin an out-of-the-way island inhabited by cannibals – including the crazed cannibal royal family hungry for a human meal. 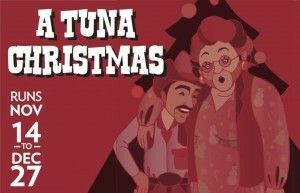 The total production is bizarre, and I found myself immersed in the infectious delight of the cast. Jordan Harrison wrote the script, and Director Jeffrey Bigger has done an amazing job of presenting the off-the-wall story. 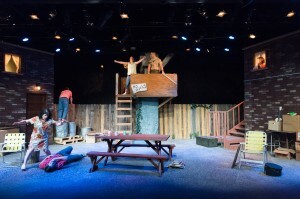 The show provides a sense of wonder, rarely found in current society. Andersen was born in 1834 and became Denmark’s most famous author. 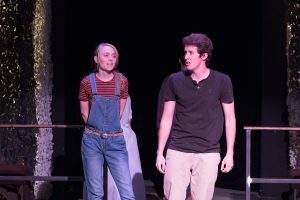 His fairy tales include “The Emperor’s New Clothes, “The Little Mermaid,” “The Snow Queen,” “The Ugly Duckling”, “Frozen.” And the list goes on and on“The Flea” is rarely mentioned, but came to light as a stage musical written by Jordan Harrison. 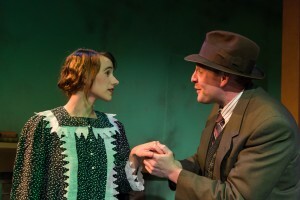 It received acclaim in 2011 receiving Barrymore Awards as Best Production of a Musical and Best Leading Man in a Musical. In the current Bas Bleu delight the“Not the Greatest” tackiness theme is apparent everywhere – the set, the costumes, the story. But the production itself is a real winner. Not the “Greatest,”but a real heartfelt winner. What are the chances? 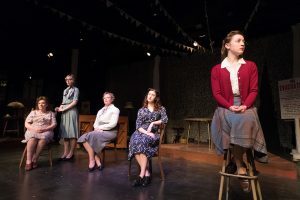 What are the chances that I’d decide to see a play this week, something I’d never heard of before, and something that did not pique my interest before sitting down in the theatre? What are the chances that I’d be thoroughly amused and idea-challenged in two hours of watching four characters tell their tales? What are the chances that the chocolate mints I purchased before the show would not melt in my pocket before the intermission? 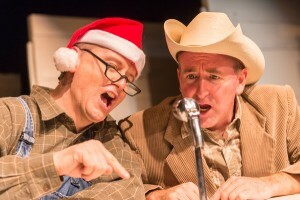 The Bas Bleu Theatre Company rehearses for its production of “Mr. Perfect,” August 29, 2018. What “chances” is life all about? Do we have any input into who we are, where we are, and what we are doing at any one time? 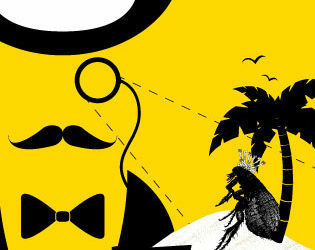 In the clever and thought-provoking “Mr. Perfect,” an off-the-wall flight attendant makes her move on an unsuspecting, and unwilling passenger in mid-air in this daffy delight on the Bas Bleu stage this month. 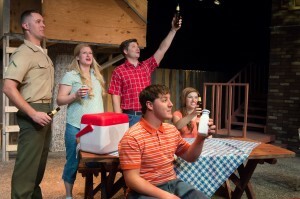 Local playwright William Missouri Downs reportedly lives in a cabin somewhere near Fort Collins. How does he spend his time in the cabin? 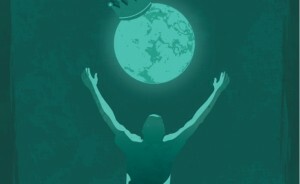 Is his world a whirlwind of thought, putting clever ideas into the mouths of characters he creates? And are we just “characters” in plays of our own, needing an itinerary for life’s path? 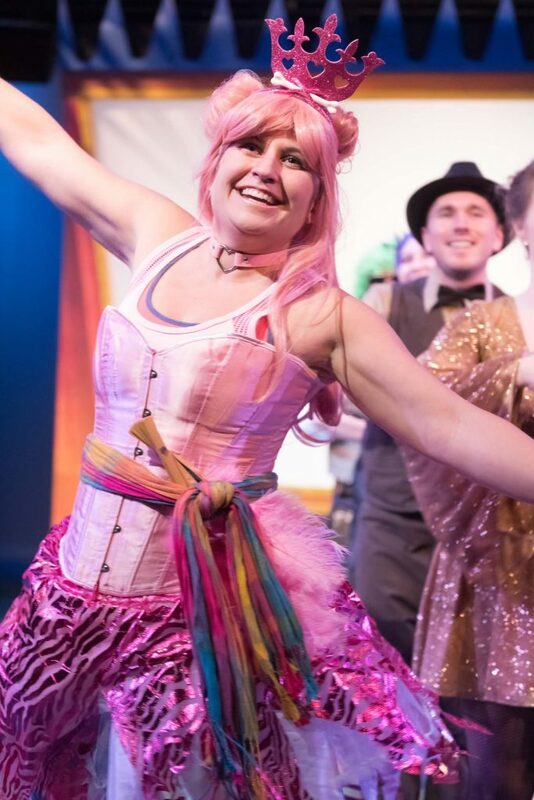 Brikai Cordova is a ditsy delight as Zooey, a stewardess (oops—an “airline attendant”) who has created her own fantasy world, listening non-stop to romance novels on tape, receiving her joys and sadness completely from the books she listens to. She persuades Jeffrey, a passenger on her flight, to join her in the airplane bathroom, hoping to seduce him high over Ohio. In order to have any kind of romantic satisfaction, she needs to be wearing ear-phones, listening to her current romance novel, or have her conquest tell stories in the verbiage tense she requires. Cordova and Verner are beguilingly-talented performers. She with her wide eyes and perfect delivery, and he with his narrator-trained voice and perfect delivery. Playwright Downs then introduces us to two other strangers on the planet who also meet my chance encounters: Ralph and Donna. Ralph is a student working on his thesis at Columbia University, masquerading as a religious parishioner to gain statistics for his thesis. 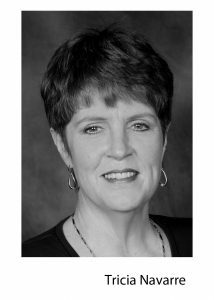 Donna is a published author, a self proclaimed authority on human relationships. 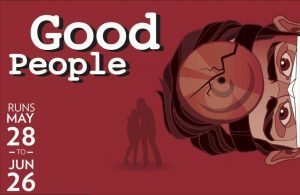 She turns out to be someone who might be human, but doesn’t have a clue about relationships. 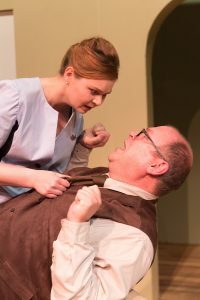 Graeme Schulz and Dominique Mickelson are both convincing as Ralph and Donna, whose lives intersect with the stewardess (oops – airline attendant) and her voice-over book narrator. The four are just about as unique as can be imagined. 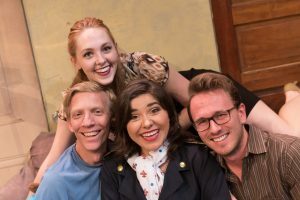 Playwright Down’s mind is on a trajectory to somewhere in the universe to have four people so uniquely different meet up “by chance” to provide two hours of non-stop fun in “Mr. Perfect.” He is a highly-respected playwright and director. 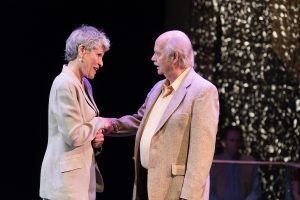 His plays have received several honors and have been produced widely in the United States as well as in Spain, Canada, South Africa, Russia, Singapore, Switzerland, Austria, India, and South Korea. His words travel well. By play’s conclusion, there is no “truth” or “error.” There is, however, the chance of enjoying a great experience, exploring the minds of four persons. They could be any of us, trying to determine our own fact and fantasy, and living out our own itinerary. What are the chances? Vanya and Sonia have reached middle age, with very little going for them. They live in the family home in Bucks County, PA, and have spent most of their adult lives looking after their now-deceased parents. Vanya and Sonia have been unhappy for so long it seems that they have forgotten what happiness is. A day’s highlight might be their bickering over whether the coffee is hot enough. Their boring lives are interrupted by the arrival of their world-famous actress sister, Masha, who breezes into town much to her peers’ annoyance. 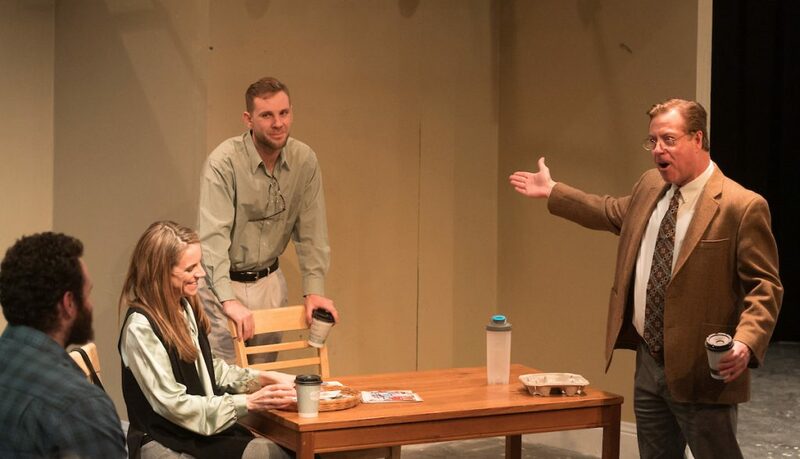 The stage is set for two and one-half hours of clever intrigue, family squabbles, and a rich coming-to-realization of what is important in life. 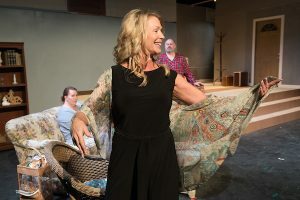 Jeffrey Bigger as Vanya, and Kelly Foerster as Sonia, are convincing as the brother and sister inhabiting the family home. Vanya is a gay man with no apparent close friends. Sonia was adopted into the family as a young girl, has grown to middle-age with no apparent friends, and no apparent interests. Neither of them is employed, and their successful sister, Masha, pays all the bills. 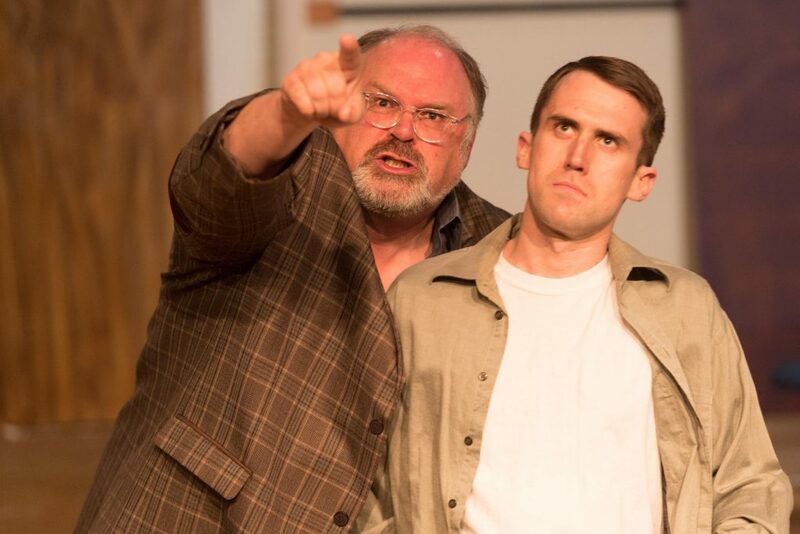 The arrival of Lee Osterhout-Kaplan as Masha lights up the stage. Masha, is an over-the-hill actress who is accustomed to having her own way with everything she does, and with everyone she touches. She arrives from her New York home with Spike, her latest gigolo, in tow. She has been through five husbands, and is currently hanging out with a young hunk half her age. Marcus Turner is super as Spike – a handsome dimwit whose main claim to fame has been to have auditioned for a bit part in a tv sitcom. Masha not only rules her young lover, but rules the stage as well. She is impressive. Her reason to travel to the family home is to find a realtor to sell the property. While she is in town she’ll take the family to a neighborhood costume party where she plans to reign supreme as Snow White. The family balks at being assigned to supporting roles – dwarfs. Vanya and Sonia and Masha were given names from Anton Chekov stories beloved by their parents. The Chekhov references are abundant, from names to family discord, even to the fading cherry orchard now reduced to just nine trees. 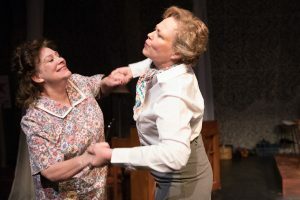 Knowledge of Chekhov is not required, but is an added delight to playwright’ Christopher Durang’s clever story. 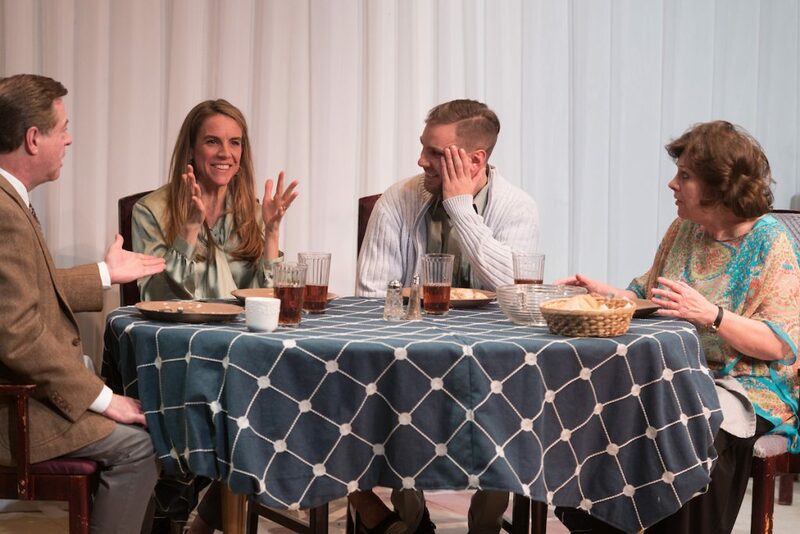 “Vanya and Sonia and Masha and Spike” opened on Broadway in 2013. Critics praised the show, and it proved to be an immediate commercial success — recouping its initial investment in less than four months. 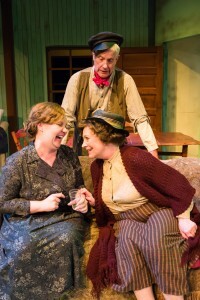 In 2013 it received the Tony Award for Best Play, the Drama Desk Award for Outstanding Play, and numerous other honors. 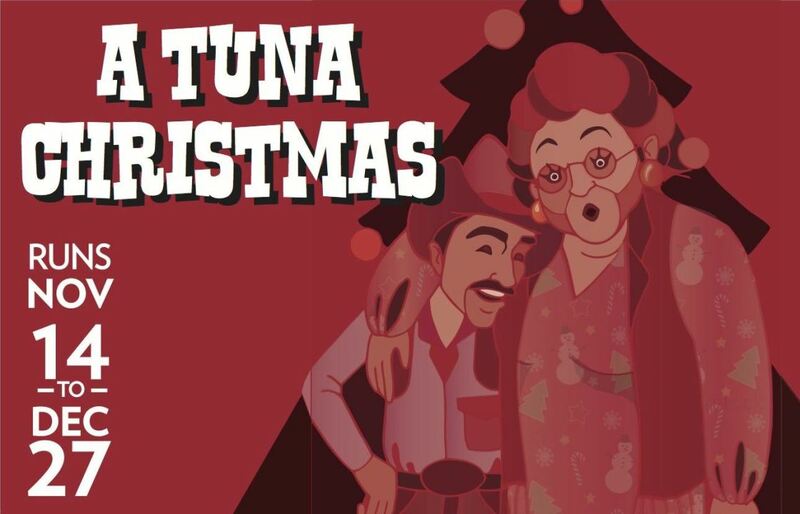 Direction for this production is by Graham Lier. This is his directorial debut, and he fills the roll admirably. I saw the first Bas Bleu public performance and was impressed with how the entire cast became better and better as the play progressed. I can only imagine how accomplished everyone will be in future performances. 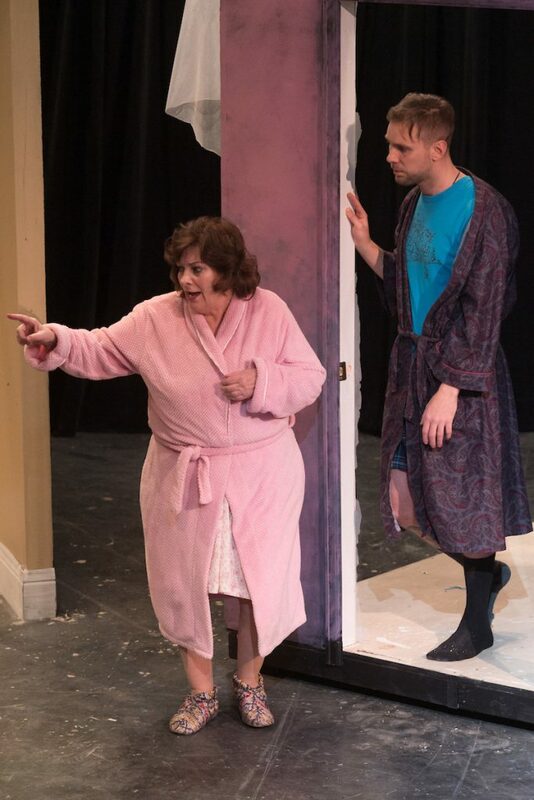 Among the initial standouts: Lee Osterhout-Kaplan as Masha who is already brilliant every moment she is on stage. 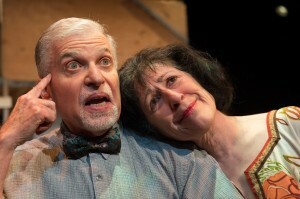 Jeffrey Bigger’s Vanya provides a tender monologue review of what life was like in the 1950s. Kelly Foerster as Sonia is heart-wrenching when speaking to a gentleman caller by telephone the morning after the costume ball. She came to life that previous evening, and can’t believe that someone was interested in knowing her better. Alexandra Bunger-Pool is a warm-hearted charmer as the neighbor girl who can find happiness everywhere she goes. Jasmine Winfrey is the voodoo-operating housekeeper who is able to put the household in order. Marcus Turner is the not-so bright Spike who has more brawn than brains, and is bewildered by the entire family. 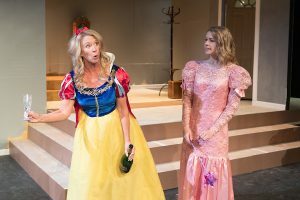 “Vanya and Sonia and Masha and Spike” (and Nina and Cassandra) are all in fine form, with this delightful fairly-tale of a family in turmoil. 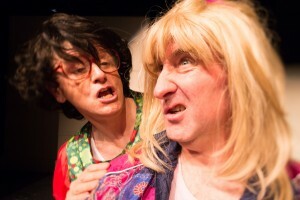 “Boeing Boeing” is Bonkers Fun at Bas Bleu! An Architect in Paris Keeps Busy Tracking Airline Stewardess Schedules. The wonderful set on the Bas Bleu stage provides the immediate idea that the audience is in for some door-slamming farce. Six or seven (I lost track of the count) doors provide enormous fun for arriving and exiting – such is the joy of French farce. 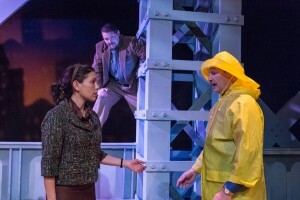 In “Boeing Boeing” the doors are not slammed, but are opened and closed in split-second timing as the cast comes and goes with clock-like precision. Bernard is a bachelor architect living in Paris. His apartment affords sweeping views of the city. It is not clear when Bernard has time to enjoy the view, or even to work, as he is the paramour of carefully selected air hostesses (we now refer to them as stewardesses) whose schedules he carefully tracks. He is in love with and engaged to Gloria, an American with TWA; is in love with and engaged to Gabriella with Alitalia; and in love with an engaged to Gretchen with Lufthansa. He keeps an up-to-date worldwide airline schedule, so that he can keep track of his private team of stewardesses. Phil Baugh is excellent as the sly Bernard. He doesn’t appear to be the least bit smarmy, but a “great to know” type of guy who is wonderful at wooing three beautiful women. He claims to love each of them, and they vow their love to him in return — not having any idea that they are sharing the guy. Berthe, was housekeeper of the apartment when Bernard purchased it, and has stayed on. It is her “home” and she has learned to tolerate Bernard’s lifestyle and abet his womanizing scheme. She knows when to cook “Italian,” when to cook “German,” and when to cook “American” (pancakes with ketchup). We first meet Gloria who is getting ready to leave the apartment for her next flight. The timing is a little close, and Bernard doesn’t want to delay her departure, as the Alitalia stewardess, Gabriella, is soon to arrive. Before Gloria leaves, however, Robert (a longtime friend from Bernard’s school days) arrives. He is in Paris briefly, on his way to Southern France to see his mother. Robert, too, is a bachelor, but has no string of women chasing him. He is aghast and amazed when he learns of Robert’s system of scheduling his romances. Jeffrey Bigger is terrific as Robert. 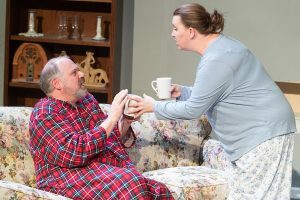 His “Robert” and Phil Baugh’s” Bernard” are excellent comedy foils, with the long-suffering Cheryl King’s sometimes grumpy, and always interesting “Berthe” tossed into the mix. As anticipated, TWA departs. Alitalia arrives. Lufthansa arrives. TWA returns. Mayhem ensues. Alexandra Bunger-Pool as Gloria, Sarah Paul-Glitch as Gabriella, and Elizabeth Baugh, as Gretchen make a great trio of “engagees.” Each has her native-country accent and traits. Each is beautiful, and each is a super comedienne! Bas Bleu is not known to be a mecca for farces. It has outdone itself, however, with “Boeing Boeing.” The plot is crazy, the set is a wonder, and the acting is first rate. It is so much fun, however, that in one moment, TWA’s Alexandra Bunger-Pool, could not restrain herself because Jeffrey Bigger’s Robert was being basically hysterical. This is a funny play! 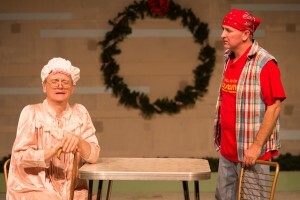 It is a classic farce, written by the French playwright Mark Camoletti. It was subsequently translated by Beverly Cross and opened in London in 1962, running for a total of seven years. In 1991 the play was noted by the Guinness Book of Records to be the most performed French play throughout the world. The original 1965 Broadway production lasted less than a month, but a 2008 revival played nearly a year, winning several awards. The plot turned up in 1965 as a movie starring Jerry Lewis and Tony Curtis. It would be difficult to find a more delightful cast romping through the Parisian apartment than those on stage at Bas Bleu. Director Cheryl King has created a joyful group of thespians hard-pressed to keep a straight face throughout the knee-slapping hilarity. 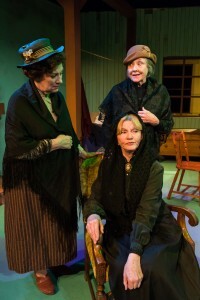 Brian Miller is credited with designing the wonderful set, and Dennis Madigan’s lighting is effective. “Boeing Boeing” soars. 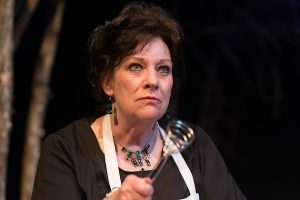 Something new is being offered: The theater is opening the new Bas Bleu Café for the run of “Boeing Boeing” on Friday and Saturday nights from 6:00 p.m. to midnight. Wine, beer and sandwiches will be available for purchase before, during, and after the show, along with mingling with the cast. A final note: This is the final show of Tricia Navarre, production manager. Trish is retiring, after serving as an integral part of the Bas Bleu team for 15 years. 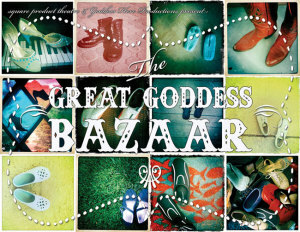 Her know-how, kindness, and wisdom have been greatly respected. “The Snow Queen” has magical scenery, costumes, makeup and masks. Lilly Bolduc is a (very) tall and impressively evil Snow Queen. She has powers to bring persons under her spell by enticing them to leave with her, freezing their hearts bit by bit. She is about to succeed in freezing the heart of another, when young Gerda comes on the scene, and does everything she can to protect her friend, Kai. 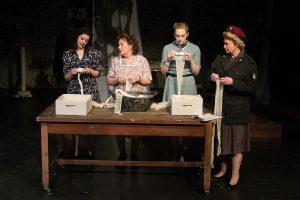 Four characters at Bas Bleu face challenges of existence in and after two world wars. 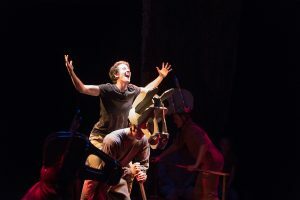 Four characters are at loose ends before, during, and after world wars in Europe in Bas Bleu’s challenging, and fascinating tale – with wonderful music. Caution is involved, as experienced theatre-goers may be over-the-top excited. Persons coming in off the street may wonder what in the world they are seeing. I was somewhere between the two with The Blue Flower. Five women tell their tales, and yes – what they wore. There is an interesting species currently roaming the world. I believe they are called “women.” They tend to be somewhat clannish, and have an uncanny knack for remembering every dress or outfit they wore in every happy and troublesome situation. 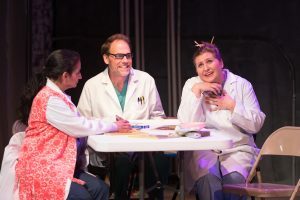 A delightful look at this group is currently on stage at Bas Bleu, and just might be called “Ehpronites,” as their play is by Delia and Nora Ephron, based on a book by Ilene Beckerman. 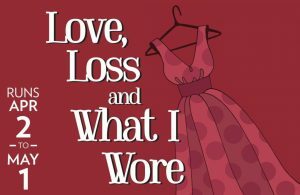 “Love, Loss and What I Wore” runs through May 1 at Bas Bleu, directed by Graciela Marin. 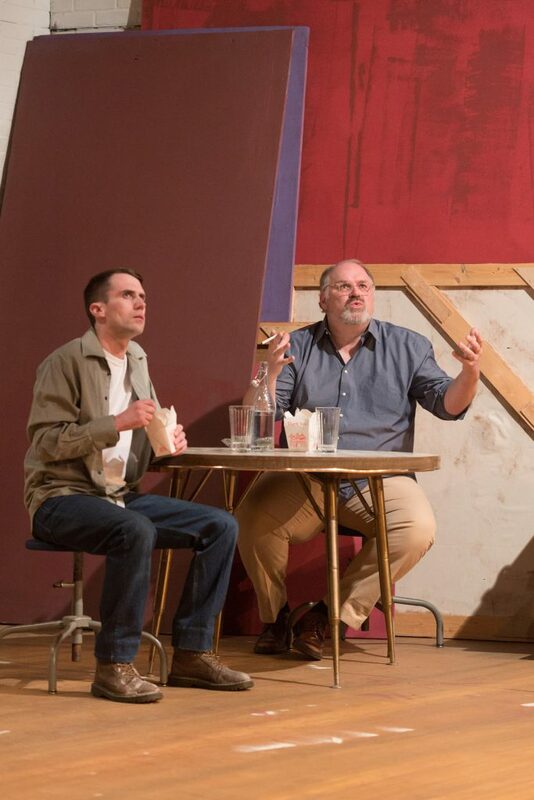 “Luv” searches for meaning – absurdist comedy, or just irritating? 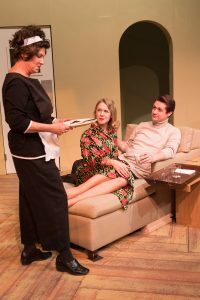 Three characters search for life’s meaning at Bas Bleu this season in Murray Schisgal’s “Luv.” Schisgal wrote the play in 1964, and it ran for nearly 1,000 performances on Broadway and received several awards. The original show, directed by Mike Nichols, starred Alan Arkin, Eli Wallach, and Anne Jackson. Great credentials! I was not familiar with the play prior to seeing the Bas Beu version this month. What did I miss? 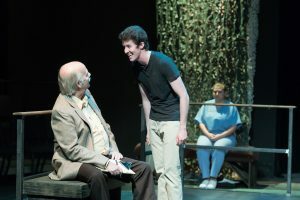 The set does look terrific, a path along a New York bridge where Harry Berlin (played by Daryl Branson) is writing a farewell note before a planned suicide leap into the river below. Life has not been easy for Berlin, and he has decided to end it all – only to be stopped by a former college roommate who turns up as Berlin readies his leap. The roommate, Milt Manville, is well portrayed by Kevin Reifel. The two have not seen each other for 15 years and compare stories of youthful terror. Manville appears to be quite financially successful, not helping the ego of the unhappy Berlin. Manville’s current problem is that he is tired of his wife, and wants to run off with his mistress. The wife, Ellen, turns up and Milt is eager to match her up with the beleaguered Berlin, so that he can go forward with his life – wifeless! 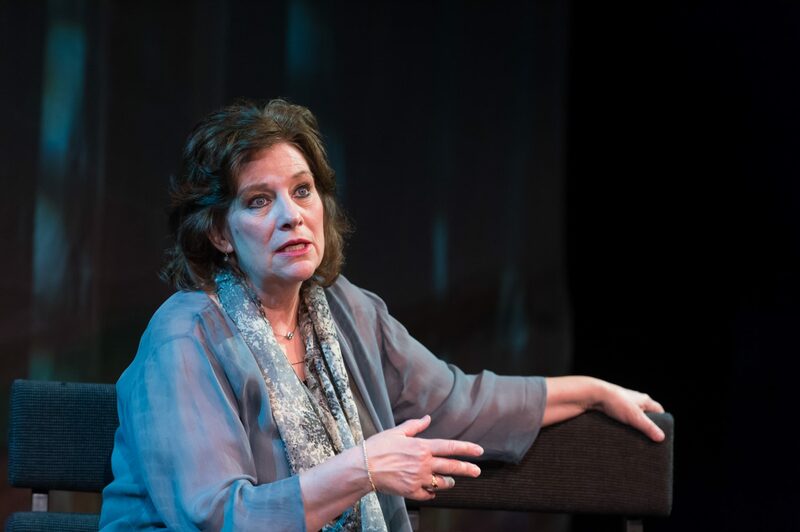 Karina Yager plays Ellen Manville, the wife who appears to have a keen mind, but not much common sense. There is some basic craziness! 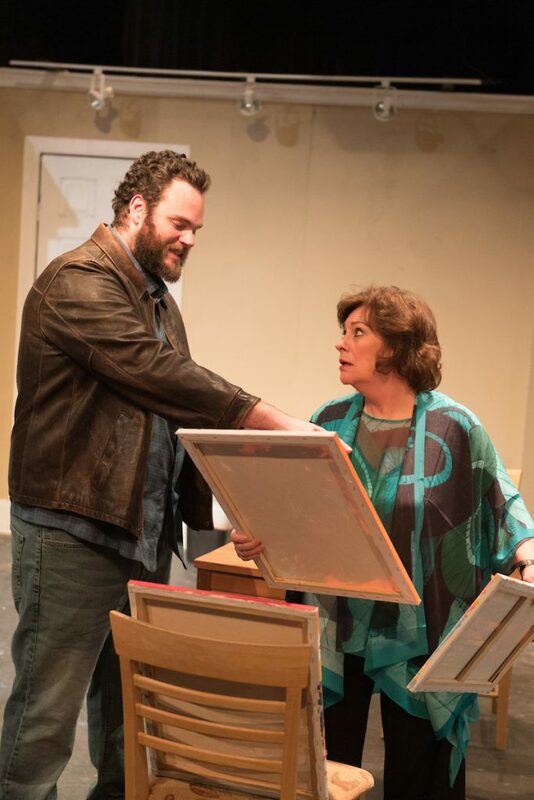 The wife, Ellen, turns up to confront her husband with a large chart mapping the success and failure of their marriage. The unhappy Berlin loses his ability to see, or to hear, or to speak, or to walk – all without warning, and leaving him rigid as a board for others to toss around! The premise has potential, but gets lost with so much talk talk talk about “Luv,” “Luv,” “Luv.” The characters never can claim “Luv” is “Love” and leave the audience wondering why this was such a successful show 50 years ago! 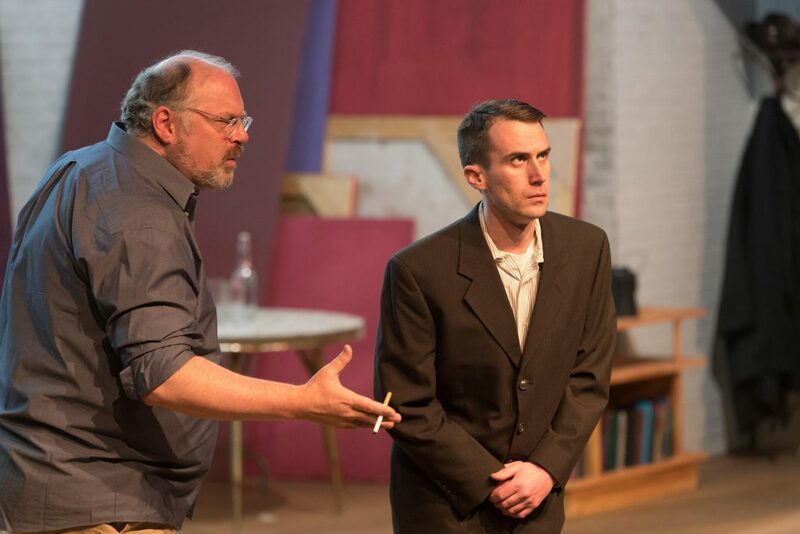 Robert E. Braddy directed the Bas Bleu version and his Director’s Statement in the program acknowledges that the show is very much a play of the 1960s and was borrowed unashamedly from the great “Absurdists” notably Edward Albee, Samuel Beckett, and Eugene Ionesco. The absurdity has now become irritating, and by show’s end (and after three tumbles in the water, only to be rescued) I was cheering for everyone to jump from the bridge, so the audience could go home. Bas Bleu has been terrific for many years in providing local audiences with sometimes-unusual challenges. As a basic romantic, however, I did not grasp what “Luv” was trying to tell me!